Businesses relentlessly seek new strategies and solutions to reduce costs and increase productivity. Every saved dollar goes back to the bottom line to fuel growth. Costs can be recovered in many areas across the office. One of the most common sources of unnecessary spending is found in the misallocation of office technology. 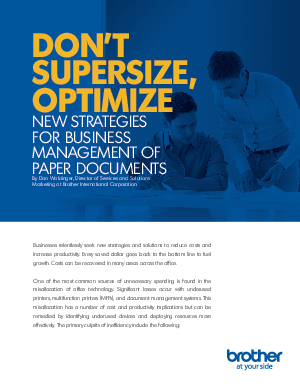 Significant losses occur with underused printers, multifunction printers (MFPs), and document management systems. This misallocation has a number of cost and productivity implications but can be remedied by identifying underused devices and deploying resources more effectively.